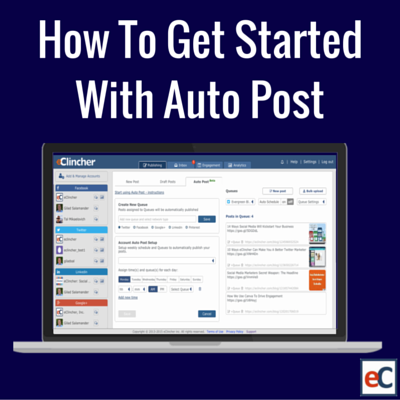 Auto post is a new way to post content to your social media accounts. By setting up a fixed schedule once, you do not have to worry about scheduling posts on a daily basis. Instead you can focus on curating and creating high quality content that will be posted automatically based on your pre-set schedule. Unlike most social media tools, the content you add to Auto Post queues will not go to waste after the first time it is shared. Instead, it will be saved and used again and again, allowing for a new audience to see it and engage. Step 1 Create Queues (Categories): First you will want to set up your different queue categories. By creating queues, you can group together related content and ensure you are not sharing too much or too little of a specific type of content. Enter a queue name in the text box. Step 2: Before pressing save, choose which network you want to create the queue for. Once you have picked a network, press save. Queues are network specific so that you can optimize your posts accordingly. Bulk Upload: This feature allows you to upload multiple pieces of content at once. This is achieved through the use of a spreadsheet. Learn more here. Step 6 Maintain Queues By Adding New Content And Removing Outdated Content: On a daily basis, adding and removing content is the only thing you will have to worry about. The beauty of auto-posting is all you have to do is manage your queues. Promotional Posts: Keep the 80/20 rule in mind when setting up your auto-post schedule. No more than 20% of posts should be promotional. Easily ensure you do not over-promote by setting up a category specifically for promotional content. Customer Testimonials: Are your customers providing positive feedback about your business? Create a queue for these testimonials and continue adding to it as your receive them! 90% of customers say that they are swayed by customer reviews, so sharing these reviews is a great way to grow your business and gain trust. Your Evergreen Blog Posts: Some blog posts never get old. So why is that we only tend to share them once? Add your blog posts to a category and automatically share them again and again. Good Morning Posts: Give your audience a boost with a good morning post! Check your Twitter analytics to see where your followers are from and create good morning posts in their language and time zone. Instead of deleting a queue that is not relevant now, but will be in the future, turn it off. This way when they become relevant again, all you will have to do is turn them on (example: holiday related posts). The possibilities for auto-posting are endless and we certainly have not thought of all the possible use cases. If you have any unique ways you currently use or plan to use the auto-scheduler, let us know! If you found this post interesting, please share it. Sign up for a 14 day free trial to get started with Auto Post.